Why does my rabbit have head tilt? Here at The Center for Avian and Exotic Medicine, we treat many rabbits with varying degrees of a head tilt. 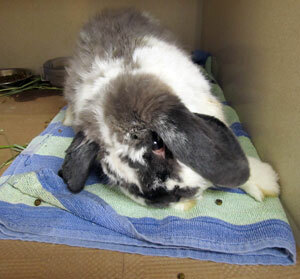 Sometimes the symptoms are mild and the rabbit’s head will slightly tilt to one side. Other symptoms are severe and rabbits will roll and spin in circles, not able to distinguish what is up or down. There are many reasons why this happens and this article will discuss some of the most common reasons a rabbit may develop a head tilt. One of the most common causes of a head tilt in pet rabbits is a parasite called Encephalitozoon Cuniculi. This organism is an intracellular protozoa (single-celled organism) that is most often transmitted by oral ingestion of spores found in infected urine. Rabbits can shed the organism up to 3 months after the initial infection. Spores can live up to 6 weeks at room temperature (71° F) and are easily destroyed with household disinfectants such as Lysol or bleach. Initially, E. cuniculi travels systemically (through the blood stream and body tissues) and targets organs with high blood flow such as the lungs, liver, and kidneys. The parasites invade target host cell and as spores develop, cell rupture occurs. This causes a chronic inflammatory response. Because of this inflammation, granulomatous lesions form, and primarily affect the brain, kidneys, and eyes. These lesions eventually are what cause damage to the tissue which result in a head tilt or other problems. The body’s immune response will create antibodies to help limit tissue damage by encapsulating the organisms and can prevent the organism from multiplying, but the spores will remain viable. Any cause of immunosuppression years later (stress, illness, aging) may result in overt disease. This is why a rabbit who has lived alone for many years can develop an active E. cuniculi infection without being exposed to another rabbit. In these cases, exposure happened when they were at the breeders or pet stores as younger bunnies. Testing for E-cuniculi may include blood tests, urine analysis, and histopathology of affected tissues. Treatment involves anti-helminthic and anti-vertigo medications, plus often hospitalization for a few days to give the rabbit supportive care in the event it is not eating from the stress of the vertigo. People often assume that inner ear disease occurs because of bacteria in the external ear canal. However, bacterial otitis is most often caused by bacteria spreading from the nasal cavity through the Eustacian tube into the middle ear, and then into the inner ear and vestibular tract. As the infection spreads, rabbits will often suffer from vertigo and can present with a head tilt, circling, or rolling. Sometimes nystagmus will be present where the eyes are moving sideways or up and down. Diagnosing inner ear disease includes a physical exam, blood testing, cultures with sensitivity testing, radiographs of the skull, and endoscopic otoscopy (using a tiny camera with magnification to image the ear canal). Treatment includes systemic antibiotics, topical antibiotics, irrigation of the ear canal, medications for pain, anti-vertigo medications, and often supplemental feedings. Parasitic encephalitis occurs most commonly in rabbits housed outdoors. Flies land and breed on rabbit fur or in skin folds and the larvae of Cuterebra species pupate in the rabbit skin and can migrate through the ear canals and central nervous system, causing torticollis, ataxia, and incoordination. By the time this parasite causes visible damage, it is often too late and impossible to treat. Prevention is the key by keeping outdoor rabbits in a clean, hygienic environment thus minimizing fly strikes. Also in outdoor rabbits, cerebral larval migrans due to Baylisascaris species has been reported. These are a kind of round worm that raccoons spread through their feces. Similar to Cuterebra, these parasites will migrate through body tissue, however these parasites tend to infect nervous tissue such as the brain. Clinical signs include incoordination, rolling, falling, seizures, and paralysis. As with Cuterebra infections, treatment unfortunately is generally not successful. Prevention would include fencing in areas to prevent raccoons from being able to defecate anywhere near pet rabbits. Ear mites are another parasite that can cause rabbits to have a head tilt. These mites are very irritating and cause severe pruritus (itchiness) and rabbits will exhibit head shaking, scratching at the ears, and if not treated it can progress to a head tilt. Testing can be as simple as a visual inspection (sometimes they are visible with the naked eye) or by looking at a sample of the discharge under a microscope. Treatment includes topical or systemic ear mite treatment and pain management. Anytime an animal suffers from blunt trauma to the head or neck, it may result in some kind of neurologic problem which may include a head tilt. Obtaining a thorough history, blood tests, and obtaining x-rays may be part of the diagnostic plan. Treatment would be based on the severity of the trauma and could include hospitalization for supportive care, pain management, anti-inflammatory drugs, and sometimes treatment for shock. Many toxins can cause illness in rabbits, and a few may cause a head tilt. One of the most common toxins we see in New York City that causes neurologic signs is lead. Old apartments with layers of lead paint are common, and rabbits love to chew baseboards. Also some old furniture or even pet toys can have lead. Testing involves a simple blood test and treatment includes chelation agents and sometimes hospitalization for supportive care if the rabbit is more severely affected. There are also plants and household cleaners that people should avoid using around pet rabbits. For a complete list, go to www.rabbit.org and search for the list you are interested in. 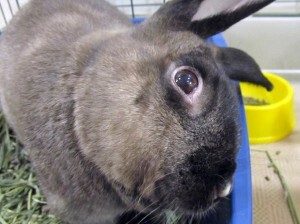 Less frequently, rabbits can suffer strokes which may render them impaired. On occasion they may appear to have a head tilt, but usually this is due to partial paralysis from the stroke. Diagnosing this would involve taking into account the history of the pet, blood testing, and possible advanced imaging such as an MRI. Rabbits also can suffer from brain tumors that may affect their neurologic function making them have a head tilt. Diagnosis also would include taking into account the history of the patient, blood testing, and possible advanced imaging such as a CT scan or MRI.